The story behind this is that I made it for my parents’ ruby wedding anniversary at the beginning of July. 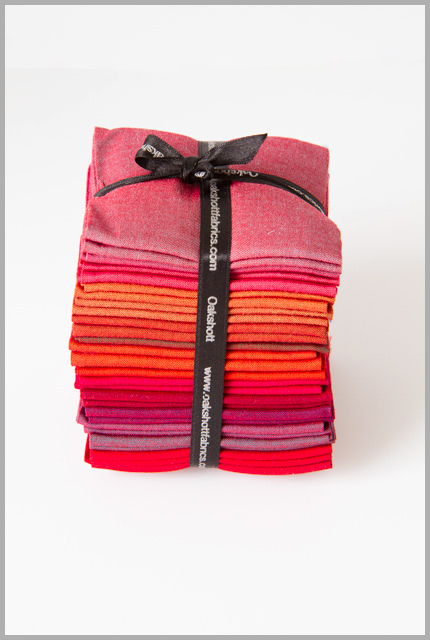 I started by grabbing a ‘Ruby’ bundle from Oakshott, which seemed rather appropriately named, not to mention the fact that Oakshott cottons are woven in India where they’ve enjoyed 2 recent holidays. Then I grabbed some flip chart paper (the perks of being the child of someone that does a lot of presentations in their day job) and drew out a heart shape, then created the outer borders and cut out my ‘inner’ and ‘outer’. Splitting my fabric into warmer and cooler wefts, and using the paper as a foundation, I started to improv piece the heart first. I started off with the entire heart, but then realised it would be easier if I cut it down some and then joined those bits together afterwards. Having learned from the heart, I split the outer into 4 sections right away. Once both the inner and outer bits were pieced, I then took a bit of yardage I’d bought of one of the middle red tones, and created a ‘porthole’ with the outer bit. I used both blanket stitch and straight stitch to hold it in place, partly from a decorative point of view, and partly because as it was a big shape, I was a bit worried that at the straight stitch part any small movement out of place would lead me to missing a bit! I’m entering this into the Original Design section of the festival, as that’s where I thought it fit best. Yay for remembering to show this awesome quilt in the festival. It was a great decision to make it in oakshott fabrics , they really make it glow!! aaah, what a beauty. Just gorgeous. Loved this when you first made it and love it now too…definitely an original! Superb – isn't it great to have friends to remind you? Yes, great choice! Glad you remembered this one. Really stunning! I'm glad you remembered this one. 🙂 It's a beautiful mini! It's beautiful and how nice to see it again. I am glad you remembered it in time for the festival. A special gift indeed. Even on the screen, the colors are fantastic. Fancy forgetting that one. It is so beautiful. Really pleased you found a quilt to enter! I don't remember this one either but it's very pretty. Love the colors, and the pattern is great – very creative!! P.S. You're not the only one who needed reminding that they had an eligible quilt!! 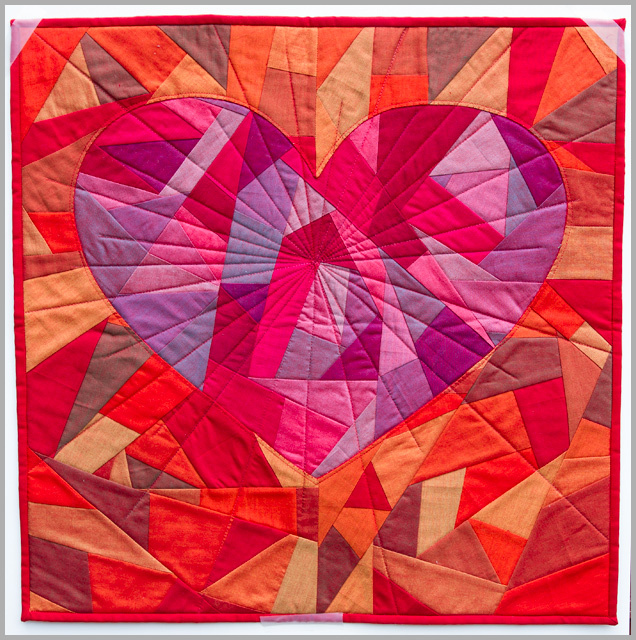 I absolutely love this quilt! It is just so incredibly stunning! 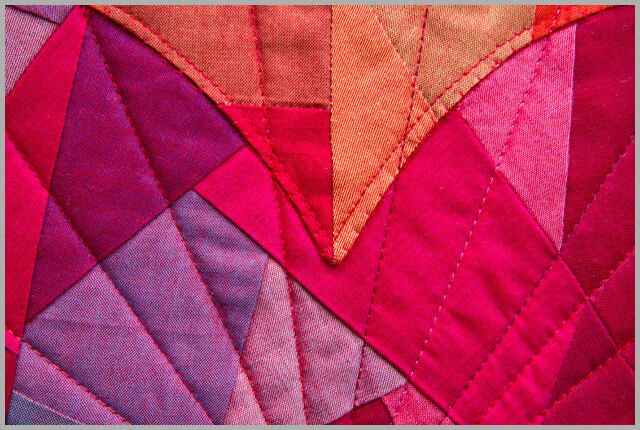 The colors, the design, the quilting, there isn't anything I don't love about it! Brilliant entry, good to see it again and I reckon it'll get my vote.